When ex-Navy SEAL Nick Foley travels to China to find purpose and escape the demons of his past, he instead stumbles into a conspiracy his Special Forces training never prepared him for. While working as an NGO volunteer for a non-profit organisation, overseeing a clean water project in western China, Nick Foley, a decorated ex Navy SEAL, is caught up in the outbreak of a deadly and unknown disease. He witnesses his friend, Batur, a Muslim and member of the local Uyghur community, die a horrifying and unexplained death. Nick and some of his team rush Batur to the hospital where they are held under guard, then moved to a quarantine ward. When it becomes apparent the disease is not contagious, Nick is interrogated by Commander Zhang, the leader of the Snow Leopards, an elite counter terrorism unit, along with Dr Dazhong Chen (Dash), a scientist with the Center for Disease Control and Prevention. It appears a specific area was targeted and Nick is a suspect in what could be either a biological attack against Muslims or a plot against China by the United States. A chill chased down her spine, and her office suddenly felt as cold and still as deep space. Nick’s suspicions, and Dash’s, are aroused when the government shut down Dash’s investigation into the possible origins of the disease, then attribute the disaster to an industrial accident and close the case. Nick and Dash join forces and uncover corruption, lies and a government conspiracy, risking their lives in the process. Beijing Red is the very promising first book in a series by two established, but new to me, authors, Jeffrey Wilson and Brian Andrews, writing under the pseudonym of Alex Ryan. Their real knowledge and experience as Navy veterans, one a nuclear submarine officer and the other a combat surgeon, shows in the well developed and realistically unfolding plot. Nick and Dash, the two main characters, are well defined and engaging, with credible back stories. The powerfully described flashback to Nick’s time in Afghanistan, and a terrible tragedy which still torments him, says much about his character. Nick’s collaboration with Dash in relation to the complex and multi layered plot is plausible, and the attraction between the two of them adds to the excitement and tension. Fast moving action drives the story along at a cracking pace, the shadowy world of political intrigue and espionage is very believable. Sometimes the narrative is a little over descriptive, clothes and weapons spring immediately to mind, and the complexities of the medical aspect of the story are quite hard to grasp. Bit it’s obvious the authors know their stuff, not only scientifically but also politically. The villains are never obvious and there are some surprising twists in the storyline, unexpected connections formed and just when it seems Nick and Dash are on the same side, doubts are raised. MacLeod Andrews’ performance, as always, is stellar and I’m looking forward to the next book. Brian Andrews is a US Navy veteran who served as an officer on nuclear submarines. He is a Park Leadership Fellow, holds a degree in psychology from Vanderbilt and an MBA from Cornell. For 2016, Brian is the co-author of two covert ops thrillers with Jeffrey Wilson: TIER ONE (Thomas & Mercer) published as Andrews & Wilson, and BEIJING RED (Crooked Lane) penned under Alex Ryan. 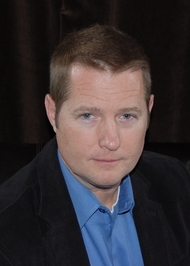 Jeffrey Wilson is the award winning author of four supernatural thrillers: THE TRAITEUR’S RING (2011), THE DONORS (2012) and FADE TO BLACK (2013) and the upcoming JULIAN’S NUMBERS (2016). He is also the co-author of two military/covert ops thriller series with Brian Andrews. For Thomas & Mercer Jeff and Brian write the TIER ONE covert ops thriller series, with TIER ONE coming summer of 2016 and WAR SHADOWS in early spring 2017. For Cooked Lane, they write the Nick Foley Thriller series under the pseudonym Alex Ryan with BEIJING RED due out in May 2016 followed by HONG KONG BLACK in December. Jeff has worked as an actor, a firefighter/ paramedic, a jet pilot, a diving instructor, a Naval Officer, and a Surgeon. He served numerous tours in Iraq and Afghanistan as a combat surgeon with both the Marines and with a Joint Special Operations Task Force. Jeff and his wife, Wendy, are Virginia natives who, with children Ashley, Emma, Jack, and Connor, call Tampa, Florida home. He still works part time as a Vascular Surgeon and as a consultant for the Department of Defense when not hard at work on his next book. I think you get more listening to it and MacLeod Andrews is a great narrator.